iRobot is an American technology company that builds a variety of robots for different purposes: whether they’re to be used by the military, police, or by the everyday consumer to help you clean up your home. With Big Apple Buddy’s personal shopping service, you can now buy direct from the USA iRobot online store anytime, anywhere. The Braava Jet Mopping Robot helps you tackle dirt and stains in even the most difficult-to-reach places. It’s perfect for cleaning areas like under kitchen cabinets and around the toilet, where you can not reach as easily with a standard mop or cleaning tool. All you have to do is attach a Braava jet cleaning pad to the robot, and the device will automatically select dry sweeping, damp sweeping, or wet mopping. The robot is able to tell what kind of cleaning a surface needs, so all you have to do is apply a cleaning pad and press clean! 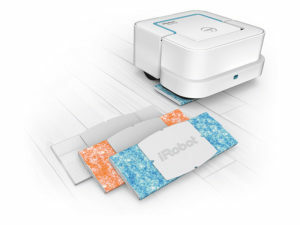 This device will make your cleaning routine a lot easier, and you can go about completing the rest of your errands while the iRobot does all of the cleaning! 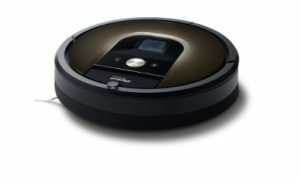 The Braava 300-series Mopping Robot is a better option for cleaning multiple rooms and larger spaces. This device will effectively tackle everyday dirt and grime, and its smart navigation software enables it to clean from room to room without needing your guidance. The robot’s Navigation Cube helps it keep track of where it’s been and where it still needs to clean. This hands-free device will leave your home looking clean and spotless--all with just the push of a button! Feel free to sit back and relax while iRobot does the hard work, or complete other errands to maximize efficiency! If you want a device with even more cleaning coverage, the Roomba 980 is the right match for you. 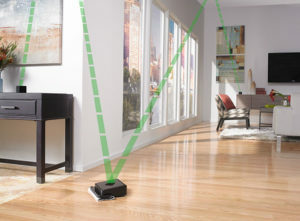 This robot can clean an entire level of your home and uses a high-efficiency cleaning pattern and a full suite of sensors to map and adapt to real world clutter, which provides you with the most thorough coverage and cleaning. This device is also designed to automatically increase power where it’s needed the most, like on carpets or particularly dirty areas of your home. As if this cleaning process wasn’t easy enough, you can also clean from anywhere by using the iRobot HOME App. Just press “clean” from anywhere, and the robot does the rest of the work! Unfortunately, the USA iRobot online store does not currently offer international shipping. However, Big Apple Buddy, your personal shopper, can help you buy products direct from the official USA iRobot online store and ship them to your doorstep, no matter where you are in the world. We offer international shipping to over 110 countries including Australia, Austria, Azerbaijan, Bahrain, Belgium, British Virgin Islands, Brunei, Bulgaria, Canada, Chile, Costa Rica, Croatia, Czech Republic, Denmark, Estonia, Fiji, Finland, France, French Polynesia, Germany, Gibraltar, Greece, Greenland, Hong Kong, Hungary, Iceland, Indonesia, Ireland, Israel, Italy, Japan, Jordan, Kuwait, Latvia, Liechtenstein, Lithuania, Luxembourg, Macau, Malaysia, Maldives, Malta, Marshall Islands, Mauritius, Monaco, the Netherlands, Netherland Antilles, New Zealand, Norway, Oman, Poland, Qatar, Romania, San Marino, Saudi Arabia, Serbia and Montenegro, Seychelles, Singapore, Slovak Republic, Slovenia, Spain, South Africa, St. Lucia, Sweden, Switzerland, Taiwan, Thailand, the UAE, the UK, Vatican City, and Vietnam. If you would like to buy from the USA iRobot online store, simply let us know which items you would like to order (by filling out the form below) and we’ll get back to you with a free international shipping quote within 24 hours!